Time and again online you come across the statement that 60% of what you apply to your skin is absorbed into it. Something that so many people are saying must be true, must it not? Well no it isn’t. But I admit it does sound sort of believable. You apply a cream to your skin and rub it in and it disappears. Where is it all going? 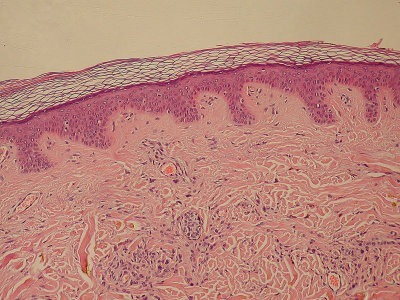 To get at the answer to that we need to have a look at the structure of the skin. The top layer of the skin is known as the stratum corneum and this comprises a highly selective barrier. It will let water across it. In theory the water from the cream could penetrate across the stratum corneum, but in practice water is continually being lost from the body’s core across the skin and into the atmosphere. So the water in the cream – a skin cream will be about 70% water typically – will just get caught up in the continual flow of water out of the body. It is important to remember that water is being lost all the time from the surface of the skin. This simple fact has all sorts of impacts, and one of them is that any chemical that you want to get to cross the skin is effectively swimming upstream against the current. Another feature of the skin that makes it an extraordinarily good barrier is its extremely large surface area. This is too small to see with the naked eye, but it is made up of huge numbers of tiny cells tightly squeezed against one another. It is a bit like a sponge that is able to absorb a great deal. This is how most moisturisers do their stuff. They absorb into the stratum corneum and reduce the speed that water can get across it. The stratum corneum is continually shedding itself so what you’ve added will sooner or later be lost from the surface. This is why you have to continually reapply your moisturising cream. Some of what is applied will make it through into the blood stream, but it will be way way lower than 60%. This whole process is of huge interest to pharmaceutical companies who would love to be able to apply drugs through the skin. Millions have been spent on studies into every aspect of skin penetration you can imagine. In fact a very small proportion of the money spent ended up in my bank account when I worked on this very area. If you read the very wide literature on the subject you will find out that we have a pretty good idea of what does and doesn’t penetrate the skin. And in fact most things don’t. That is why you don’t see insulin patches or aspirin patches. I can only think of three drugs of any significance that have the right properties to be successfully applied in patches. Caffeine, nicotine and glyceryl trinitrate. Nearly everything else is effectively blocked by the stratum corneum. But even for the small number of ingredients that can get through the skin at all, there is still one more line of defence. The skin contains enzymes that break down chemicals into smaller and easier to handle materials. So the small proportion that gets through is quite likely to have been transformed before it reaches the blood stream. So bearing all this in mind it is impossible to believe that 60% of what you apply to the skin gets through to your bloodstream. I don’t know what the true figure is. It might be a couple of percent. If I was basing it purely on my own work I’d put the figure below 1%. But if you really want to know you could always do your own experiment. One day instead of eating the traditional way through your mouth have a go at getting your food to absorb through your skin. If the 60% figure is correct this really shouldn’t be very difficult. Good luck! This entry was posted in Scaremongers on July 19, 2011 by Colin. Colin I just smeared some cottage pie all over my face and it didn’t get obsorbed. Its all over the carpet – can I send you my carpet cleaning bill as I hold you totally responsible. Does this apply to products like fake tan? I know they are made of natural products but do they enter the blood stream? Has anyone ever done any research specifically on fake tan? WOW this is pretty hard to believe, where has this stat come from? Yes, I agree that moisturizing skin creams are probably not very effective: there are a lot of dead and dying cells (being constantly pushed upward) that the water has to penetrate. Maybe if you put a lipid-rich coating over that part of the skin afterwards, it might slow down the water escape. Quite frankly, I believe that dietary measures (and treating any existing hypothyroidism) work better. However, it’s my impression that skin creams are an effective way of delivering chemicals to the blood because they enter through the pores. Aren’t hair follicles near to blood vessels, drawing nourishment from them? And pores should operate the same way. Yes, the pores are a good route of entry. That is why your face tends to be more sensitive than your hands. This post worries me particularly because of the number of prescription medications that apparently do get absorbed. @Jenny, yes there are a few molecules that can cross the skin pretty easily. Ibuprofen is one of them. Nicotene and caffeine are others. It is a shame that more aren’t because there are lots of drugs that it would be really good to apply in patches. Diabetics would love to be able to give up injecting insulin for instance. I’m afraid I don’t know anything about hyoscine. After reading this article and all these comments, it set me thinking, especially in the light of my recent experiments and subsequent results over the past four years. I used to have a pretty bad dry skin until when a Harley street doctor, of the company I work for at the onset diagnosed eczema as well. He prescribed steroids and it didn’t take rocket science to discover they were causing me more harm than good. So, I set it out find a solution. I started with cheap aqueous creams and went on to the expensive ones, leading me to discover the ugly, the bad, and the good. So, I started eliminating the ingredients and started formulating mine. Now, all the eczema and dry flaky skin are gone (only that I wished I took pictures of before and after). There was certainly an effect from the blend of natural stuff that I was using. Besides, family and friends started trying it out and getting results within weeks. So, I very much disagree with the “washing off effect” or “sweating off effect”. Lastly, what about those who use skin lightening products? I have seen people from ethnic minorities who want to get brighter skin – some with devastating effect. What are those creams/lotions affecting? In answer to John, there is a difference between product being absorbed into the bloodstream and into the skin. I believe they’re using topical magnesium patches and gels now. Apparently it is absorbed better by the body than if it is taken orally. That’s true, skin can absorb more magnesium than our digestive system.